The demographics in America have changed, especially in my corner of the world. Atlanta now hosts one of the largest refugee populations in the nation, and I love it. I am surrounded daily by different languages, foods, and customs. Of course, one of the most prevalent languages in my area is Spanish. Which is why I wanted to learn it. I had a background in French, but it’s not something I can use every day. 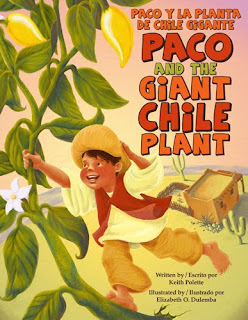 I was about to turn 40 (a time to realize goals) and a big fan of Jack Tales, when Raven Tree Press (specialists in bilingual picture books) approached me to illustrate an adaptation of “Jack and the Beanstalk”: Paco and the Giant Chile Plant ~ Paco y la planta de chile gigante (written by Keith Polette). I took intense Spanish lessons at the Latin American Association for two years in preparation for the release of Paco (I couldn’t have a bilingual book and not speak Spanish! ), and the bilingual picture book industry moved high on my radar. Happily, the book did so well, Raven Tree wanted more work from me. This time as the author too, for Soap, soap, soap ~ Jabón, jabón, jabón. Writing a bilingual picture book is similar to all-English with a few new requirements thrown in. With Raven Tree’s books, the Spanish is embedded in the text so the reader can decipher the meaning of words through context--that can create an interesting puzzle to write. Repetition also helps so the reader has more than one chance to absorb the new vocabulary. In Soap, soap soap, the line “Soap, soap, soap! Jabón, jabón, jabón!” is repeated throughout the text (and is lots of fun with an audience). 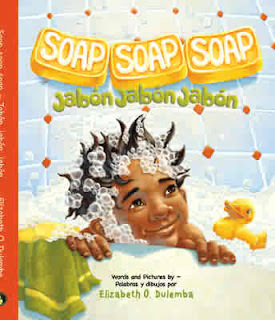 By the end of the book, the reader surely won’t forget that “jabón” (pronounced “habon”) means “soap”! Because of my Spanish lessons, I was able to write most of the bilingual version of Soap, soap, soap on my own (it also comes in all-English), but Raven Tree works with a translation company to make sure everything is correct (or to translate for authors who don’t speak Spanish). We didn’t have to make many changes, but there were some amusing hurdles. There are phrases we use in English which simply don’t translate, and visa versa. Those had to go. And there were some terms that had several options. For instance, the ditch that Hugo jumps over in Soap, soap, soap is called “la zanja.” It also could have been “el arroyo,” but “la zanja” was more specific. Of course, I have to pronounce it correctly when reading aloud, or ‘la zan-ha’ ends up sounding like “lasagna”! Marketing a bilingual book is a bit different as well. Obviously there are regions of our country where the books will be more popular, like mine. I’ve had the pleasure of occasionally speaking to all-Hispanic audiences - that’s a treat. I’m not fluent, but I have received amazingly warm reactions to my attempts to speak Spanish. In fact, I’ve often felt flat-out adopted by the Hispanic people I’ve dealt with and their extensive families! Because, whereas my typical audiences will often be made up of one or two parents with their children, an Hispanic audience will more likely be made up of the entire family--parents, aunts, uncles, grandparents, you name it. And they often all participate in the activities I hand out. The first time I gave out my bilingual word find puzzle (sopa de palabras) to an all-Hispanic audience, I looked up to see adults who, I knew, didn’t speak much English, working out my puzzle right along with the kids. It had become a literacy tool! I about cried with joy. The head of the Alliance Theatre’s Teaching Artist’s program flipped over Soap, soap, soap after seeing a galley at a recent SCBWI conference. Turned out she’d been scouring bilingual picture books for ones with repetition and embedded Spanish, for the very reasons I mentioned above, and there just weren’t that many to choose from. Soap, soap, soap is now one of the main titles in their programming this year. I’m thrilled! The need for bilingual picture books is so strong right now, publishers and book buyers alike are scrambling to meet the demand. And it’s not just for Hispanic audiences. I’ve signed books for parents who are raising their children to be bilingual--giving them a strong advantage in our changing society. And because of the educational element of bilingual picture books, they tend to scale up and be used by older children, even adults, trying to learn English. Ironically, they are also being used by Spanish speakers who can’t write in Spanish. Many publishing houses also now have bilingual or Hispanic imprints to meet this need, but I particularly like Raven Tree’s approach. They especially like folk tales because a familiar story or structure can give a reader something to embrace and offer one less thing to stumble over when trying to learn a new language. Even the economy hasn’t been able to squelch the momentum for bilingual books. The top Spanish-Language book guide (for English speakers), Críticas, recently folded . . . for about three months. The public outcry was so fierce, I’m happy to say it is back and one of the main resources for teachers, librarians, and book buyers to use when trying to find new bilingual or Spanish titles. For me, writing (and illustrating) bilingual picture books has opened a new world with rewards I never could have imagined. It is a distinct honor to share some of my favorite stories with a new audience, but better yet, I feel I’ve been embraced by a group of people I have come to adore. Hispanic? Latino? Or What? Notes from the newsroom on grammar, usage and style. From Philip B. Corbett of The New York Times. Peek: "While both 'Latino' and 'Hispanic' are generally acceptable, some people have a strong preference. We should respect those preferences as much as possible in referring to individuals and groups; reporters and editors should routinely ask."